Union flag is one of the nation flags that becomes my favourites. It signifies the unity of England, Scotland, Ireland, and Welsh that make up United Kingdom. More than that, to me, i like them because the cross design with strong lines variation as the main element and colour combination is so appealing and the punk vibe i'd love to associate with British fashion that is out of ordinary. i love the union jack! asikkkk uda beli 50mm 1.4 juga ! skrg kt sama :) hohohoho..
i love these shots very much !! and your bf looks super cool too !! check on my new post ya. Love the union jack motif as well - great t-shirt! And u're bf's shots are loves!! c fhen! where did your bf got that backpack? omg I am in love! both of you look super cool! I am here back in sg hahaha! love the top darling plus your boots...are just amazing!!! i have some union jack items too. they are lovely... please visit my blog and participate in my giveaway..
totally awesome! loving the rock&roll british looks! 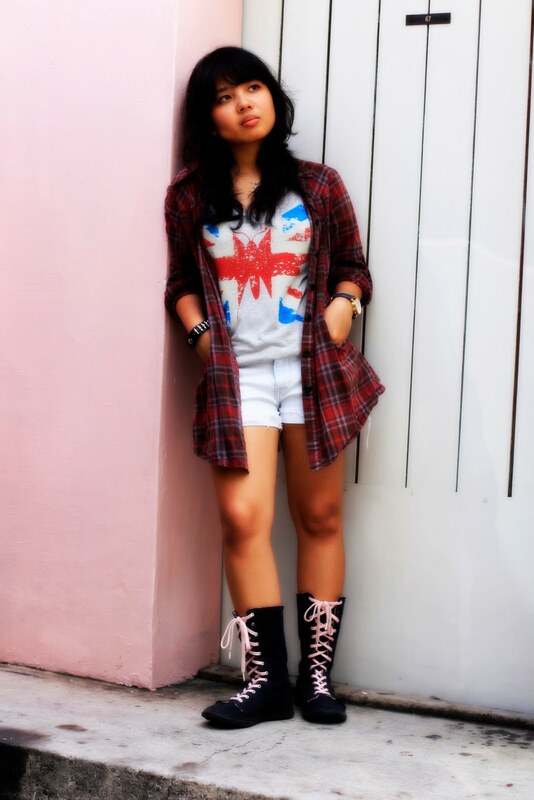 loveee your boots and shirt so much! T'shirtnya keren deh. I have one but yours is much cooler! oh I like your shirt! lol I was just thinking, how come the british flag is a hip trend but if I wear like a canadian flag people would be more like wtf than "oooh that's so chic!". I do love your shirt very much!! Loving the look of union flag.. I like your body language on these photos. my friend has the topshop blazer (: and i love your tee! such a good style you have!! great items! and you look great. hope you will become a follower of my blog too? Really fun theme for a post, darling! Hi Hun! Thank you so much for your sweet comment and for dropping by at my blog. I really appreciate it. 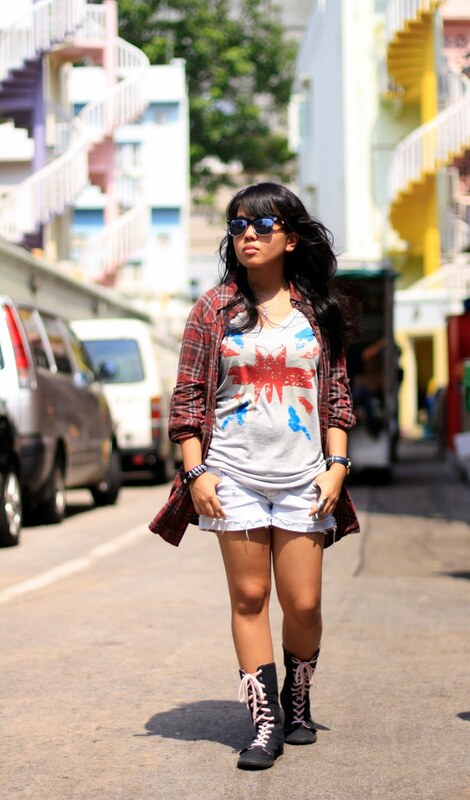 I love the Union Jack too as a fashion statement. 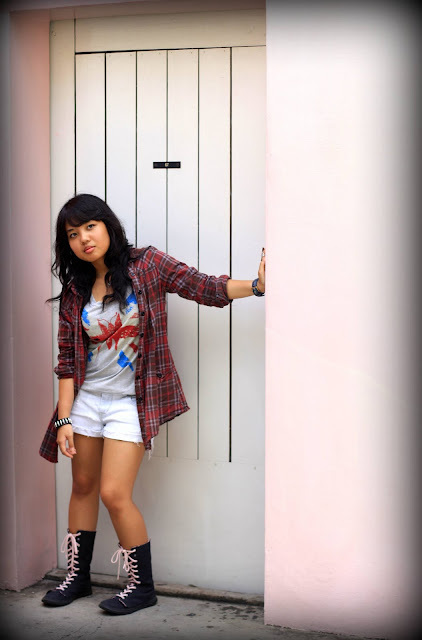 Lovely shirt and you look great :) I love how you paired the F21 tee with the plaid shirt unbuttoned. Great look.. I love that tee! love your outfit and your boyfriend look very cool in that picture! It's just an incredibly fashionable flag - and looks very good on the boy and you! Happy London Fashion Week! omg.i like ur boot.so gorgeous. love your street style soo mucch! You are absolutely gorgeous, darling! I love all your fabulous outfit posts - you pull looks together beautifully!